Halloween costumes in parties, trick or treat or in celebrations is all about scaring, and who can do it better than a skeleton. 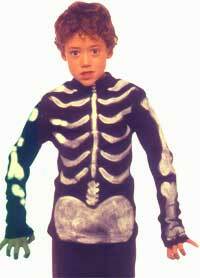 So we thought to bring in a skeleton costume to you, one that you can make at home for free. To add onto this you can have a white cap, paint your face like a skull, and have black leggies and gloves. Have a very Happy Halloween. You will need this page again and again if you choose to make it. So remember to hit Ctrl+D to bookmark the page. Long sleeved black Tshirt, Chalk fabric marker, white fabric paint, large sheet of card, pot of water and a thick paintbrush. Insert card into the Tshirt body and sleeves. Use the chalk fabric marker to draw outlines of the shoulder blades, rib cage, spine, and hips on the front of the Tshirt. Draw outlines of the arm bones on to both sleeves. Use the thick brush to paint the bones on the front of the Tshirt with white fabric paint. To make the bones really white, do two coats. Allow the paint to dry between coats. To finish off, paint the bones on both sleeves. Leave the white paint to dry throughly between coats. All you have to do now, is to wait for Halloween!